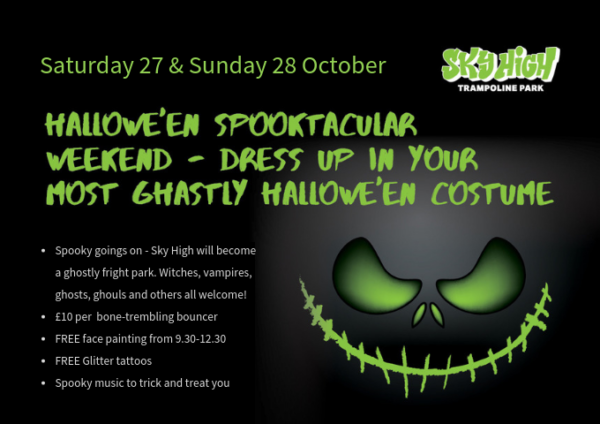 On Saturday, 27th and Sunday, 28th October, Hallowe’en is taking over Sky High! Don your most hideous fancy dress and get ready to scare the wits out of your buddies! Our spooky face painter will be here at various points over the weekend to transform you into a witch; a spider; a ghost or a victim of Hallowe’en horror…or come to think of it anything you choose! Toddler session will run as normal on Saturday from 9-10am with fancy dress and prizes for the best costumes and bouncing, then at 10am things will start to get really spooky! Please book in advance as its going to be a busy weekend. Those witches, ghosts, zombies and vampires only come out to play once a year – don’t miss it! There’ll be FREE face painting and glitter tattoos from 9.30am – 12.30pm so get here early on. And don’t forget happy hours at 10am where you can bounce for half price – that’s just £5 per bouncer!